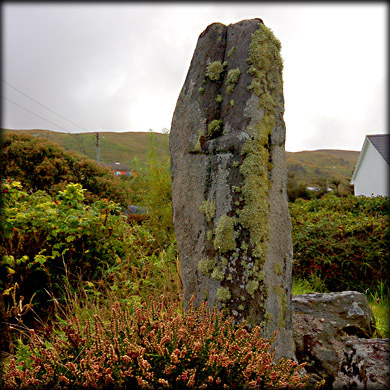 I had been looking out for this cross pillar on my previous two visits to Gleanncholmcille without success. But on this trip I made a much more determined effort to find this stone. 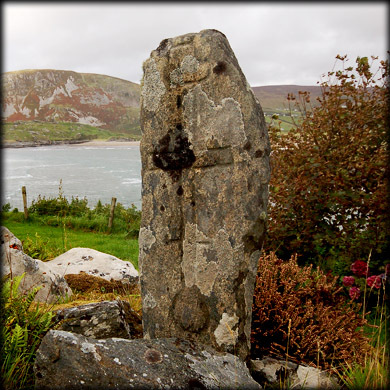 We had visited Inishkeel earlier in the year and had read about St Conall and the pilgrimage that was performed between Inishkeel and Gleancholmcille. During this latest trip to Donegal my self and Deb searched for other pillar stones along the pilgrimage route including St Connell's Cross at Kilcashel. 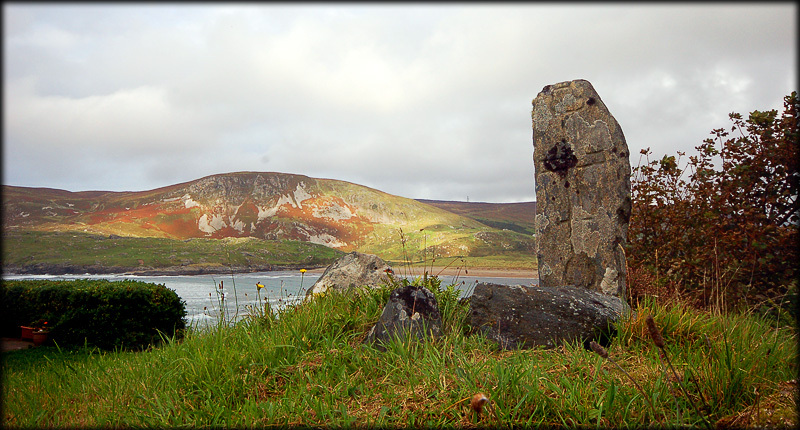 The Pillar at Doonalt is said to be the most westerly of the stones associated with St Conall's Turas. The stone is 1.30 metres high and is sitting in a small leacht. The west face pictured left is decorated with an unusual cross. There is also a simple cross inscribed on the north face and a larger cross is inscribed on the east face pictured below. Another site along the turas route is the cross inscribed boulder at Laconnell. Situated: From Gleanncholmcille take the R263 west towards Malin More, approximately 100 metres passed the Folk Village there is a small house on your right named Glen Bay Cottage. Next to the Cottage is a track leading to another house behind Glen Bay. The Cross Pillar is in the garden of the second house immedately on your right. Please ask for permission to enter. Discovery Map 10: G 5191 8462. Last visit Sept 2010.